If you have not secured your seat for the 9th, but would like to take the class, please call us at 989-463-8366 and we will put you on a waiting list. ​Alternatively, please consider securing your seat now for the December 14 or January 11 classes! For this first lesson, our instructor, Amanda Salisbury, who also teaches Art at Luce Rd. Elementary School, will be working with pastels and paint to create an autumn apple still life. This class will bring out the children's self-expression, improving concentration, refining motor skills and channelling their energy in a positive direction. This class is offered in series during the year. Please check back for upcoming dates! Classes will be held at Alma Community Art Center. Powdered graphite can be used as a drawing medium - it produces a soft effect and is more forgiving and reworkable compared to pencil shading. Steve's artistic talent combined with this unique medium will make this a fantastic class - don't miss out! Little Artists programs are held on 2nd Saturdays, October through May, from 1:00-2:30 at the Alma Public Library. ​Check our calendar to get dates for upcoming classes! ready to make some art?! If you have not secured your seat for the 19th, but would like to take the class, please call us at 989-463-8366 and we will put you on a waiting list. Alternatively, please consider securing your seat now for the February 16 or March 16 classes! Did you paint a banner last year? ​Banners are still available to be picked up at Alma, St. Louis and Ithaca City Halls. If you painted a banner last year, and have not picked it up yet please do so as soon as possible. Banners will be kept until Memorial Day weekend. The Downtown Art Expo Committee is pleased to announce the chosen designs for the Banner Project 2017, and would like to thank all those that took the time to submit a design. Banners will be hanging soon in a town near you! Sorry - we are full for this month's class! If you would like to be on the waiting list, please call 463-8366 and we will let you know if there are cancellations. If you would like to take next month's class, you can register now below. Submissions were reviewed by the banner design selection committee and the chosen entries reflect the wide diversity of community participants. Banner painting has been scheduled in 2-hour sessions and may take from 1 to 3 sessions. Paints and supplies will be provided. Children must be supervised during the sessions. Or - reserve online! Registration finalized upon payment. A 4-week drawing course designed to improve your child’s creativity and confidence in drawing. We introduce kids to drawing tools, techniques, and exercises that will help them draw anything they see. Kids will explore acrylic, watercolor, charcoal, tie dye, ceramics and much, much more. This year's Art Camp instructors will be Jody Schnetzler, Diane Clise, Steve Hawkes, Diane Zakala and many others. New this year will be a closing reception celebrating all of the work created throughout the week! See more. Learn how to create beautiful fine art on birch slabs. Students will create an 8x10 pyrography piece based on either a photograph that they bring or pre-picked designs will be available. See more. Alma Community Art Center and First Baptist Church have teamed up for this very special event. Open to young artists’ ages 8 years and up, each month students will learn color theory and create works of art that explore those principles. Class will meet from 10:00-noon on First Saturdays at First Baptist Church in St. Louis. See more. ACAC has teamed up with Cops & Doughnuts Alma Precinct﻿ for Brushes & Brew. Join us as we use coffee grounds and watercolor paper to create unique sepia-toned paintings. We meet on 3rd or 4th Wednesdays from 10 a.m.-noon. See more. The Gratiot Downtown Art Expo showcases local talent and community spirit! The goal is to produce 75 banners, designed and painted by our local citizens and students. These banners are displayed on downtown lampposts in Alma, Ithaca and St. Louis from late May through mid-November, creating a colorful and unique city streetscape. We received and reviewed 185 submissions this year! Banners are up now, and will hang until early November. Have you found yours? Congratulations to all whose work was chosen, and thank you to everyone who submitted work! brushes & brew - caffeine-infused creativity! ACAC has teamed up with Cops & Doughnuts Alma Precinct﻿ for Brushes & Brew. 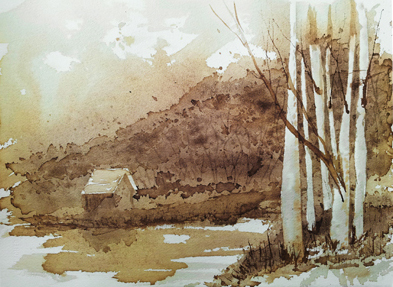 Join us as we use coffee grounds and watercolor paper to create unique sepia-toned paintings. We are very excited to have Diane Clise of the Creative Arts Guild of Mid-Michigan as our featured artist! Alma Community Art Center and First Baptist Church have teamed up for this very special event. Open to young artists’ ages 8 years and up, each month students will learn color theory and create works of art that explore those principles. Class will meet from 10-noon on 1st Saturdays at First Baptist Church in St. Louis.